Directly from us, directly to you. Place your orchids in a north or east-facing window or behind sheer curtains in a south or west-facing window. Be careful of direct sunlight as it may cause the leaves to burn. If you can’t provide natural sunlight, you can try a fluorescent plant light. Just like in real estate, the location of your Plainview Pure Orchid is important. Do not place your orchid in front of a window or vent, but be sure to open a window in the summertime and allow warm, fresh air into the room. During the winter months, place a small fan in the room to move the air around. Temperature changes help the plants bloom. Daytime temperatures should range between 65 and 80 degrees, while the nighttime temperature should be around 60 degrees. Your Plainview Pure Orchids love moist air so try to keep the humidity level around 55-75%. While that may be pretty moist and difficult to sustain, proper watering will help the orchids adjust to lower levels of humidity. It is important to not over water your Plainview Pure Orchid. Since Pure Beauty Orchids are grown in moss, the moss will hold moisture for a long period of time. You can also sign up for weekly watering alert reminders.Check your orchid every 7 days, (for arid climates, you may want to check more frequently).Check to see if the moss is damp. If the moss is dry, water and drain the excess from the container. You just want to make the moss damp and not have standing water in the container. Once all of your flowers have faded, you can cut the stem, or spike, to encourage new growth. Be sure to heat sterilize your cutting tool before you start so that you do not infect your Plainview Pure Orchid. Locate a node and cut the spike above any node located toward the bottom of the plant. The nodes are the triangular bumps along the spike that contain dormant buds. Be sure to cut just above the node – about ½”. Replant your cut spike in potting soil and if there is enough energy, a new Plainview Pure Orchid may grow. Apply fungicide to seal the spike that you just cut and prevent bacterial infection. If you don’t have fungicide, you can apply cinnamon powder or melted candle wax to protect your orchid. Wait a few weeks for a new flower spike. If the stem dries up, simply cut it back to the base and a new spike should grow in a few months. Note: If the spike is brown or yellow, new buds will not form. Simply remove the entire spike if it is discolored. Ideally, with proper rest, food, light and cooler nights your Pure Beauty orchid will produce flowers twice a year. After the last flower falls, use a sterilized tool to cut the spike halfway down the stem. Let your plant rest for several days before you trigger new growth. After re-energizing, your orchid will need cooler nights in order to re-bloom. Because Plainview Pure Orchids are temperature sensitive, they require at least one month’s worth of nighttime temperatures around 55-60° F. You should also feed your orchid a balanced houseplant fertilizer mixed with room-temperature water at ½ the recommended strength every other week. Place the plant in the sink, ensure drainage holes are visible and thoroughly water using this weakened solution. Lastly, provide a consistent light source. Mark the side of the pot facing the light and after watering, replace the pot exactly as it was before you moved it. This prevents the flowers from twisting as they bloom. New growth will appear as mitten-like roots growing upward as opposed to sideways or downward. 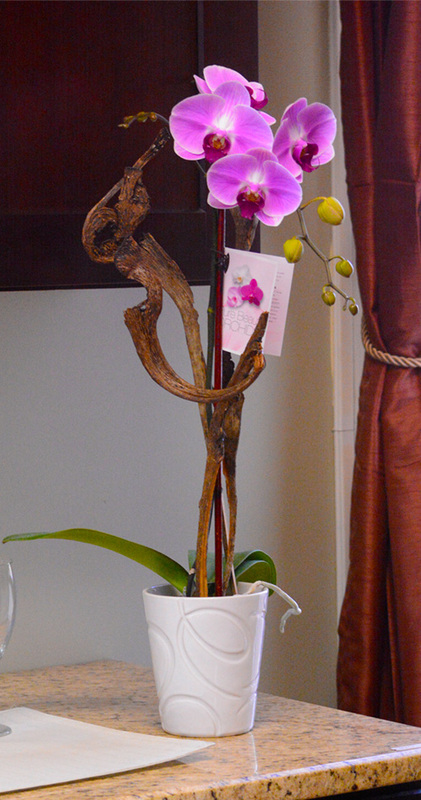 Once this occurs, return your Plainview Pure Orchid to its normal environment. Loosely secure the new spike to a stake being careful not to damage the roots or the new growth. Note – If the stem turns yellow after the last flower has bloomed, there is no chance of re-blooming that spike. 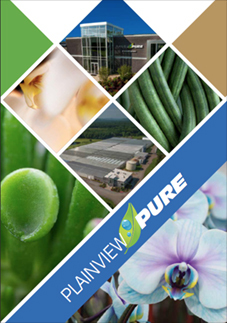 Simply cut it back as close to the bottom of the plant as possible and let your Plainview Pure Orchid rest. Also, do not to feed your orchid while in full bloom.